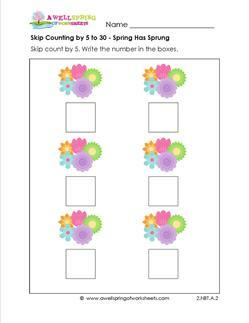 Our selection of second grade counting worksheets includes skip counting by 5’s to 100 worksheets. These worksheets come in a variety of levels: for kids just learning to count by 5’s (counting by 5’s up to 30) to kids who are really getting it. All these skip counting worksheets have pictures of five objects per count of five with a box underneath for kids to enter the numbers. You’ll find an extra fun question with the last worksheet. Please go to this page to choose from all the counting worksheets on this site. Skip counting by 5 can be really fun when you get into it and get the counting rhythm going! These colorful worksheets have different objects in groups of 5 – from spring flowers to polka dot balloons to nickels to sheep! If kids fill in a number and aren’t sure what comes next, they can count the objects in the next set. Includes one page counting to each ten – 30, 40, 50, 60, 70, 80, 90 – and then four sheets counting by 5’s to 100.